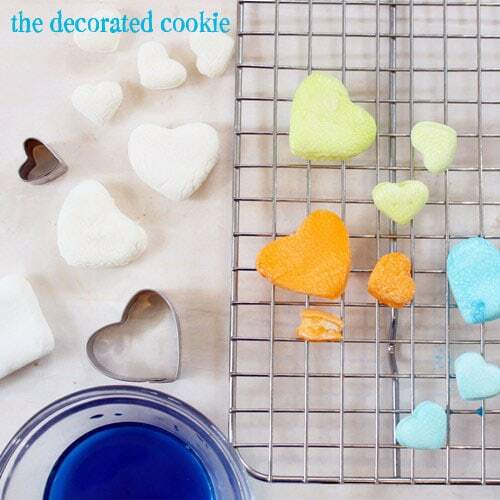 Dip-dyed marshmallow hearts are a pretty, pastel treat for Valentine’s Day. This one goes in the category of quick and easy to make, always appreciated in my house. But I’ll warn you that they do take a while to dry. As in, a few hours. 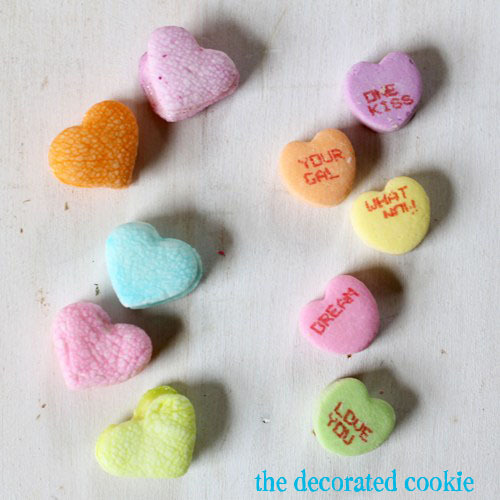 I’m not entirely sure what one would do with tiny bite-size dip dyed marshmallow hearts, but I’ll let you use your imagination for that. 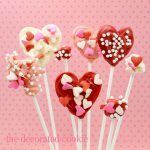 Maybe package some in a little cellophane bag tied with ribbon for a Valentine’s Day treat? Add to hot cocoa? Eat? Leave a trail for your husband to the Godiva catalog? Or in my case, maybe to the Anthropologie catalog. Or to my bed. You know, to nap. O’ sleep. How I miss thee (thanks a lot new baby). They do look a good bit like conversation hearts, too. You might like these other ideas. *The Stackermallows should be found in the supermarket. These are the flat, rectangle marshmallows. I used a 1-inch and 1 1/2-inch heart cutter. You can likely find heart cutters in the craft store this time of year. For food coloring, I suggest Americolor Soft Gel Pastes (Electric Pink, Electric Green, Orange, Sky Blue and Electric Purple used here), found online or in specialty stores. Line a baking tray with wax paper and place the cooling rack on top and set aside. 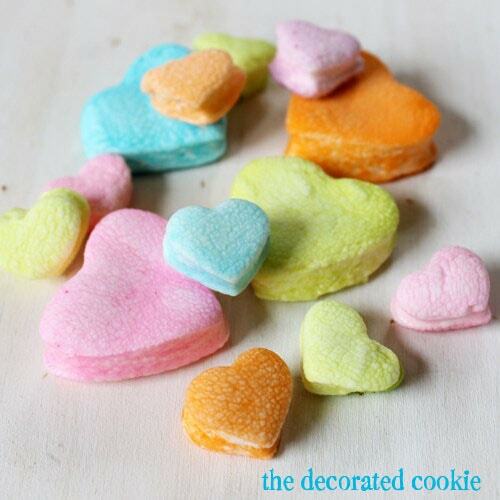 Use the cookie cutters to cut out hearts from the marshmallows. Mix two or three tablespoons of water with a drop or two of food coloring in the small bowl or cup. Place a marshmallow in the mixture and quickly remove by scooping out with a fork. Place on the cooling rack to dry. This will take awhile! When the top is dry, flip over to dry the underside. These are so adorable and I never knew about Stackermallows! 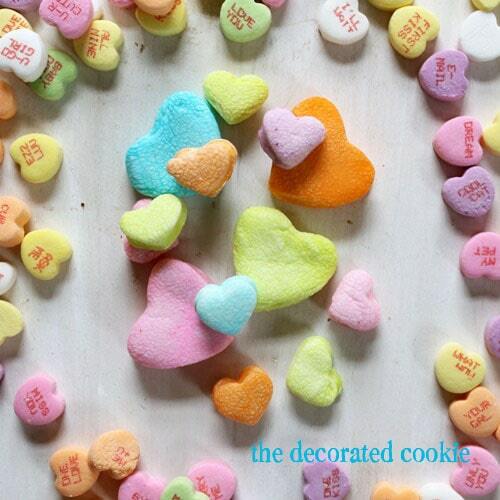 These would be so cute strung as an edible necklace….you need a little something sweet, it’s right around your neck! 🙂 Thank you for sharing and I always enjoy your blog! So adorable!! How are you doing? well, I guestt I know!! I bet baby V is so big and adorable. These would be awesome on a plate of s’mores supplies around the fire, or on top of a warm cupcake! 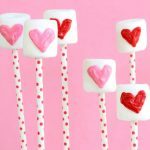 The hearts are adorable, but I am more excited about the “stackable” marsh- mallows! I never knew such a thing existed, but it’s such a great idea. The Kraft website indicates they seem to be available mainly at Target, in NJ. I also know a really cute, quick cupcake idea with marshmallows for anytime flowers are appropriate. It’s from one of the books in the adorable HELLO, CUPCAKE series. You just cut regular marshmallows in half ON THE DIAGONAL, then dip the sticky part in colored sugar. Then arrange in rings from the outside toward the middle on the top of a cupcake, and add a candy or mini-marshmallow for the center. I’ve done it with a Girl Scout troop, and they loved it. Lisa, thanks for the tip about Target! (Though I live in DC, I’m from NJ, actually, most of my family is there.) I know exaaaactly what marshmallow flowers from that book you’re talking about, too! 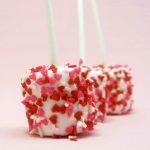 What a great way to create Valentine’s Day marshmallow treats. Love it and am pinning. What a fantastic idea! 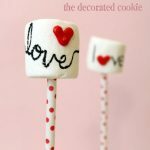 I love easy treats and these turned out very cute! you could take these after they dry and use those edibile markers and write cute sayings or names on them. Rita, great minds! I thought about doing exactly the same thing and had that debate right before photographing. They were dry enough to write on, so it would’ve worked, definitely :). I love these! You’re totally the marshmallow queen! So simple and cute! Something to add to my list of Things-to-make-in-winter! I am a vegan, do you think I could use vegan marshmallows ? Your dyed hearts look adorable. I think vegan should work Suzie! HOmemade, though, maybe not. The store-bought ones have that sort of coating that isn’t sticky. That’s all you need. Cute cute cutie cute! Hope life as a family of 4 is going well!! 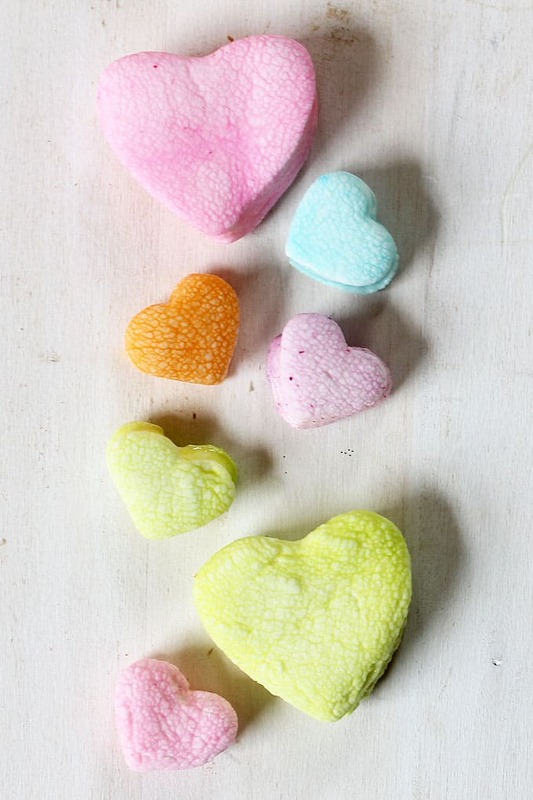 These marshmallow hearts are perfect to make for Valentine’s Day! I can not wait to try and make them! They look so awesome and like tons of fun to make! 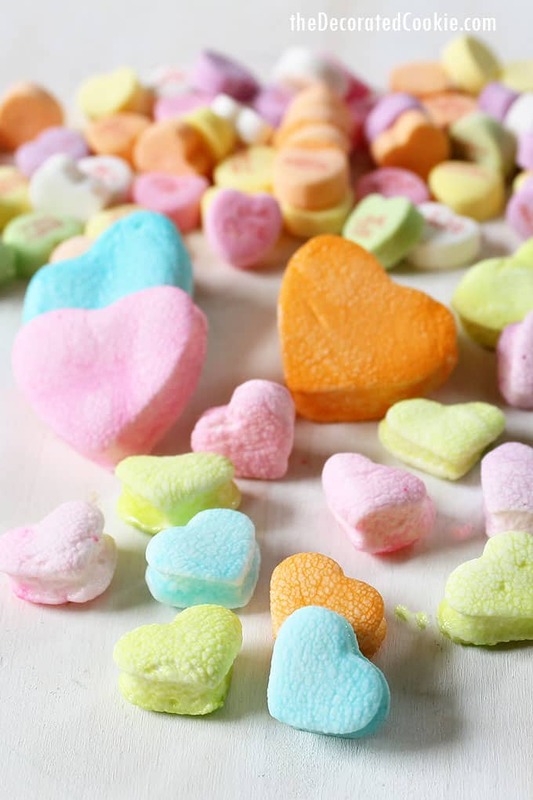 I have always bought the Valentine’s Day candy hearts in the store but it would be so cool to say that I made them myself when I give them to people! I love all of the Valentine’s Day candy but the hearts are my favorite! I love this- they look so cute when they’re done. I love~love~love these! Awesome idea..and Happy New Baby & Year!